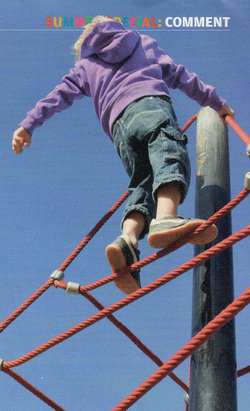 Mike Wragg, senior lecturer in Playwork at Leeds Metropolitan University, on why children need some risk in their play. characteristics: the play was generally outdoors; it involved a large number of friends; adults were conspicuous by their absence and a genuine sense of risk and danger was almost always present. In more recent years, these liberated depictions of childhood play have given way to less inspiring images. The great outdoors has been replaced by the walls of the bedroom, and adults are ever-present chaperones in the increasingly restricted lives of children. This development appears to be a consequence of an unhealthy obsession with the over-protection of our children. The causes are often cited as an increasingly dangerous society, health and safety legislation, and a prevailing culture of litigation. "Being over-protected can prevent children from learning about possible dangers and about how to protect themselves from harm." Thirdly, the number of legal actions brought against childcare settings has been declining for several years. climb trees, build dens, get filthy - and occasionally have the sort of accidents that one would expect of a freely playing, happy child. Appropriate policies are important. The Big Swing, an adventure playground in Bradford, has a risk policy which states: "Children playing at the Big Swing will occasionally hurt themselves." Remember the ways you loved playing as a child... Don't underestimate children's ability to manage their own risk-taking.